The other day I made an iPouch for my iPad from some felt I had. I’m very pleased with it. What do you think? By the way, I contacted the Sacred Threads people and they kindly offered to contact the artists of the one’s I want to show you if I can send them a list. I haven’t made my final selection yet but when I do I’ll email them back and hopefully if I get permission I’ll be able to show you some of these beautiful works. I saw your iPouch on Facebook. I like it, also. 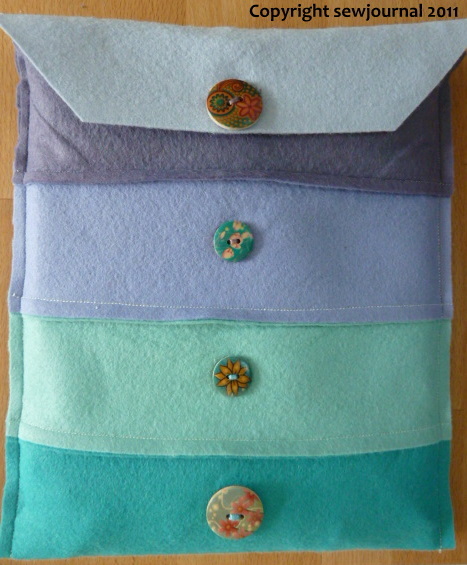 The colors are lovely, and I like the way you have them arranged; and the buttons add just the right touch. I have my mother’s button jar, and I should find a way to use some of them in a project. Some of those buttons are quite old. She always saved buttons if something was no longer wearable. I’m looking forward to seeing the photos of the Sacred Stitches. What a lot you have to go through to get permission! I am waiting eagerly to see the photos of the quilt. I’ve heard from you AND Fran how beautiful they were.